Once you figure out how to read the water meter, you can use it to detect leaks, notice sudden spikes in usage, and monitor daily usage. Detecting Leaks: Start by turning all water-using appliances off, so that no water is being used anywhere in the building. Then check the position of the meter dial and wait. If after 15 minutes, the dials haven’t moved, your meter is “holding” and all fixtures are tight. However, if you notice that the dials have moved, check the toilets for leaks. Put a few drops of food coloring or dye tablets (provided by your water utility) into the toilet tank and wait a few minutes. 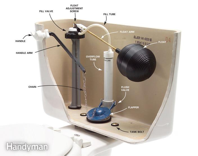 If there is blue in your toilet tank, you have a leak, probably at your flapper valve. More information on flapper replacement is available at toiletflapper.org. Also check the water level in your toilet’s tank. In a standard toilet, the water level should be one inch below the overflow tube, labeled in Figure 3. If the water is overflowing into the tube, try to set reset the water level according to manufacturer’s specifications. If the valve fails to shut off, your fill valve should be replaced. If there is no leak in the toilets, check all angle stops under your sinks and hose bib connections. If the connections are tight, there may be a hidden leak or a blind leak in an underground pipe or within the walls of the property. Detecting “Blind” Leaks: If you think you might have a blind leak, you can try to isolate the leak by use of your main house valve or supply valve. You can also contact your local water utility to assist with leak detection and give recommendations for reducing your water use. Go to WaterWiseSB for a list of agencies that provide water checkups.